Sharp’s soundbar looks the part, while its 220W speaker system packs in an impressive amount of heft – even if the audio struggles to hold together at higher volumes. Packing in a variety of audio drivers into one slimline body, a 2.1 soundbar offers a smart compromise between native television audio and the expansive 5.1 surround sound setups favored by truly committed audiophiles. So if you’re looking to boost the sound on your television set, a soundbar like the HT-SBW420 is a practical way to enhance your home movie experience, or just let your favorite talking heads shout that little bit louder. The Sharp HT-SBW420 is a budget 2.1 soundbar looking to compete with the premium competition – while Sharp is known for focusing on the affordable end of consumer gadgets, on paper the HT-SBW420 offers the style, functionality and audio output of a much more high-end model. We spent some time with Sharp’s soundbar to see how well it delivered, but one thing’s for sure: it certainly looks the part. On design alone, the Sharp HT-SBW420 certainly impresses. The 1000 x 122 x 52mm profile is suitably slim, and able to fit in snugly at the feet of your television or on a nearby shelf. Its gray or black coloring means it should blend in around most other hi-fi devices, while the smooth wooden finish on the casing evokes a far more high-end feel than you’d expect in this price range. Indeed at £199, the HT-SBW420 sits very much towards the budget end of the soundbar price spectrum, but you wouldn’t know it from handling the kit. The controls are also pleasingly straightforward, limited to a simple black remote. You’ll find a standard wheel design for playback and volume, with tactile rubberized buttons for controlling EQ – with distinct settings for movies, music, or news – or switching between Bluetooth and Wi-Fi inputs. You can also control the soundbar through the Sharp Player mobile app, which lets you link up numerous devices for simultaneous ‘multi-room’ play. Those wanting to control everything through their regular TV remote can even link up their set through the soundbar’s audio return channel (ARC). There are separate ports for optical and coaxial cables (included) which can transfer audio data between hi-fi devices more effectively, though they require corresponding ports, and neither are necessary for general use of the soundbar. 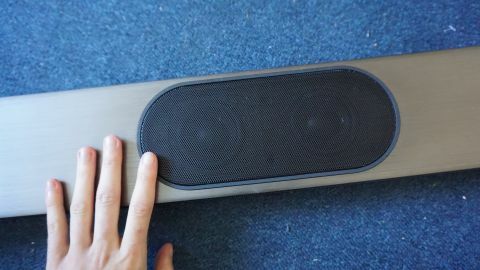 Naturally, the most important part of a soundbar is the sound, and the HT-SBW420 promises a lot in this regard, with a total of six drivers across the soundbar delivering a total potential output of 220W. It’s an impressive number on paper, even if it’s unlikely you’ll ever be using it at maximum volume – not at home, anyway. We found the soundbar well-suited to home listening, offering detailed audio with plenty of bass and mid-range presence even at lower volumes. The HT-SBW420 was more than capable of bringing out the distinct blows and clashes of battle in Peter Jackson’s The Hobbit, while also admirably highlighting the vibrato throughout Florence + The Machine’s 2018 track The End Of Love. You may be disappointed, however, when ramping up the volume, which causes a huge amount of distortion that overwhelms the audio detail. While there’s enough power in the speakers to shake the walls, it feels more like a blunt instrument the louder you go. For its £199 price tag, the Sharp HT-SBW420 is a solid all-round soundbar capable of a lot of heft. It’s well suited to home listening, playing a movie in your living room, or blasting techno at a house party that isn’t too bothered about the audio detail. While the speakers can go loud, you might want to avoid pushing them too far; naturally you’re not getting the audio performance here of higher-range devices, like the Samsung HW-MS650 or Sony HT-ST5000, although you’d also be looking at a substantially larger investment for the upgrade.